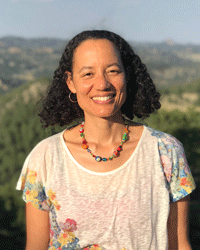 Kaira Jewel Lingo teaches meditation and mindfulness internationally, with a focus on activists, people of color, artists, educators, families, and youth. She began practicing mindfulness in 1997. An ordained nun of 15 years in Thich Nhat Hanh's Order of Interbeing, she is now based in Washington, D.C., leading retreats in the U.S. and internationally, offering mindfulness programs for educators and youth in schools, as well as individual spiritual mentoring. She edited Thich Nhat Hanh's, Planting Seeds: Practicing Mindfulness with Children and has articles and chapters published in numerous magazines and books, including Real World Mindfulness for Beginners; Together we are One; and Dharma, Color and Culture. She explores the interweaving of art, play, ecology and spiritual practice and is a certified yoga teacher and InterPlay leader. In addition to her roots in the Zen tradition, she practices and teaches in the Insight tradition and is an affiliate teacher with the Insight Meditation Community of Washington. Visit kairajewel.com to learn more.